Keep that yule log far away from your dog! Christmas truly is a wonderful time of the year. Families come together, to feast and laugh, and continue traditions through generations with our furry friends by our side. We often have a huge array of delicious yuletide treats that have been a part of Christmases for generations in our family, and would be sorely missed if omitted from the table. Whilst it’s a struggle to refrain from ‘just one more’ Christmas treat ourselves, it’s even harder to resist our pet’s puppy dog eyes, but we all must. Many ingredients commonly used in Christmas cooking can be really dangerous for animals, and can lead to severe illnesses and on the most unfortunate occasions, fatalities. Alarmingly, the RSPCA has reported in previous years that roughly 25% of pet owners intended to “treat” their pet to a full Christmas dinner! A regular feature on a Christmas table is turkey, which frequently causes animals stomach upsets if consumed. Turkey is a very rich meat, and even in small amounts can lead to stomach cramping and diarrhoea, but more importantly watch out for turkey bones and carcass. Turkey bones are brittle, and often splinter and shatter as opposed to crumbling into edible pieces. This makes them a real danger to pets, as shards of bone can get caught in animals’ mouths or digestive tracts and can require surgery for removal. Another common Christmas food to keep well away from your animal is stuffing. Stuffing almost always contains garlic and onion, both of which are poisonous to cats and dogs and cause severe stomach upsets. They also contain toxins that attack your animal’s red blood cells which can lead to anaemia, so make sure you keep this out of their bowl as well. Lots of people ask us about chocolate. Chocolate being poisonous to dogs is not a myth – it is certainly poisonous, and can have some really nasty effects on your dog. It can lead to tremors, seizures, and fatalities. Whilst Christmas is often a time for us to indulge in choccy treats, you need to be really careful to keep chocolate out of your pet’s reach. Alcohol also needs to be added onto the list. The negative effect of alcohol on our animal’s body is not known about enough. Animals aren’t able to metabolise alcohol in the same way as humans, making it potentially deadly. 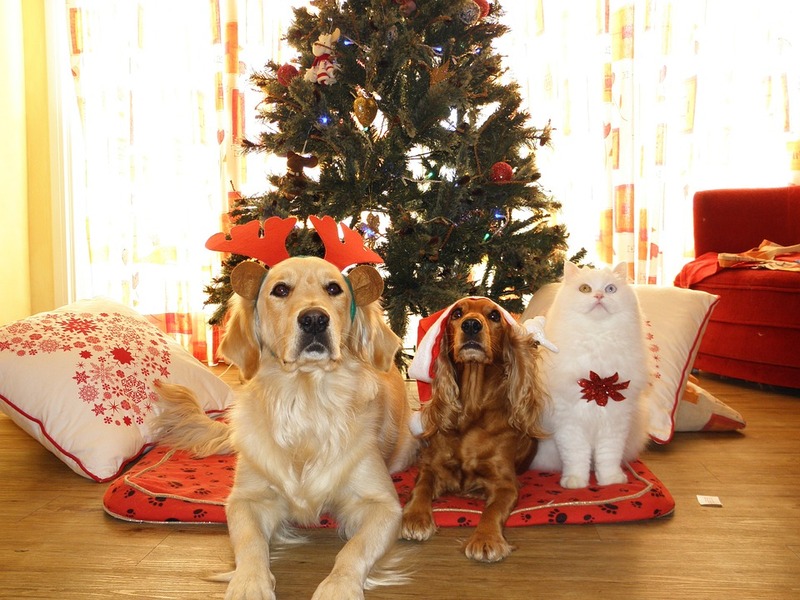 Pets, especially cats, are often drawn to milky alcoholic drinks such as Baileys or egg nog which are often seen at Christmas time, so due care needs to be taken to make sure that they are only enjoyed by humans. At Withy Grove, we offer a huge range of animal friendly treats, which can be given in place of dangerous Christmas foods. With these treats and following the above guidelines on Christmas snacks, you can make sure you have a jolly Christmas and keep your furry friends happy and healthy. If you’d like any more information on food safety for your animals, don’t hesitate to pop into the Withy Grove practice, or call our friendly team on 01772 330103. It could be a question that saves your pet’s life.